further abused a mother trying to help her children.."
relate to as family. I am speaking out and blowing a big whistle." about her abuse concerns over her daughter's childhood. businessman who owned the gambling business. and said he would welcome an appeals court review. or defense wants to file, they are free to file," Blake said. subsequent hearing that he had nothing to do with the Callahan killing. cause harm to come to any human being," Connolly said Dec. 4. Nicholson playing a Bulger-like Irish-American gangster. President of the University of Massachusetts). Interpol released a "red notice" for Bulger. In 1979, Howie Winter was arrested along with many members of his inner circle on charges of fixing horse races. Bulger, who was left out of the indictments, stepped into the vacuum and took over the leadership of the gang. He transferred its headquarters to the Lancaster Street Garage in Boston near the Boston Garden in the city's North End. As of early 2008, this historic garage is up for sale. While Howie Winter and most of his organization's leadership were sentenced for fixing horse races in 1979, the FBI persuaded federal prosecutors to drop all charges against Bulger and Flemmi. Bulger and Flemmi then took over the remnants of the Winter Hill Gang and used their status as informants to eliminate competition. The information they supplied to the FBI in subsequent years was responsible for the imprisonment of several Bulger associates whom Bulger viewed as a threat. But the main victim of their relationship with the federal government was the Italian-American Patriarca crime family, which was based in the North End, Boston and in Federal Hill, Providence. After the 1986 RICO indictment of Underboss Gennaro Angiulo and his associates, the Patriarca Family's Boston operations were in shambles. Bulger and Flemmi stepped into the ensuing vacuum to take control of illicit gambling and drug trafficking in and around Boston. By 1988, Bulger headed an organization that ran all of the rackets (e.g. extortion, loansharking, bookmaking, truck hijackings and arms trafficking) not just in Boston but throughout New England. They were also the main narcotics distributor in the state, receiving their drugs from a Cuban-American gang based in South Florida. They were earning so much money that they set up "The X Fund," which was used for payoffs of individuals in politics and law enforcement. It has since been revealed that members of the Boston Police Department, the Massachusetts State Police and the Federal Bureau of Investigation accepted bribes from the X fund. John Connolly grew up in the South Boston housing projects a few doors down from the Bulger family. He formed a fast friendship with Billy Bulger, and admired Billy's mysterious and mischievious older brother, "Whitey." By the mid-1970s, Connolly was an up-and-coming FBI agent eager to make his mark in the agency's Boston office. Bulger, meanwhile, was climbing the ranks of the city's underworld and looking to expand his power. In 1975, the old Southie acquaintances formed a partnership from which both would benefit. Connolly persuaded Bulger to sign on as an informant, a coup that soon made Connolly a star within the FBI. The agency valued high-level snitches, and in the Boston office there were none more highly placed than "Whitey" Bulger. Working on tips from Bulger and his partner, Stephen Flemmi, the FBI began dismantling the Irish mob's chief rivals, the Italian Mafia, paving the way for Bulger's ascendancy. In exchange for the valuable tips Bulger provided, Connolly and his fellow agents allegedly helped the gangster elude the law by tipping him off to sting operations and cutting deals to save him from prosecution. Under this cloak of protection, Flemmi and Bulger built a blood-stained drug and racketeering empire. 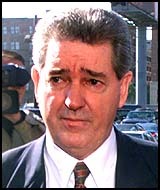 Connolly retired from the FBI in 1990, accepting a highly paid job with Boston Edison and eventually retiring in 1991. With Connolly out of the picture, the FBI dropped Bulger and Flemmi as informants and began targeting them, eventually handing down federal racketeering and extortion charges against the pair in 1995. The dark details of the FBI's secret pact with the Mob emerged in 1998, during a year-long series of federal court hearings into Flemmi's request to dismiss racketeering charges against him. The following year, a federal indictment charged Connolly with alerting Bulger and Flemmi to investigations, falsifying reports to hide their crimes, accepting bribes, and funneling payoffs to his former supervisor, John Morris. A second indictment handed down in 2000 charged the former FBI star with leaking information to Bulger and Flemmi that led to three slayings. Gianelli who is married to Elizabeth Moore, Connolly's sister. murder and faces a possible sentence of 30 years to life in prison. Stanford Blake, considered a motion by the defense to dismiss the case. Yesterday they sentenced FBI Agent Connolly to 40 years according to my local tv news. Great podcast. In Boston, it seemed they used the Godfather movie stereotype to go after the more established and less violent Italian gangsters who were bookies while the FBI favored the real vicious killers who had the info, would rat the other side out and then take it all over. Whitey Bulger's gang killed way more than the Italian mafia did. Yet the FBI put one group in jail and let the others kill left and right. Hmmm, sounds like someone unhappy with the divorce settlement. That was my exact reaction to the audio! Eve was more evasive and cryptic than Sybel Edmonds and not quite as persuasive as Amanda Keller. The part where Eve recounted how she gave documents to the therapist, the therapist's office was burgled, she asked the therapist to speak to the detective who was investigating the case and the therapist refused! Yeah right! Is that how it works? All Eve had to do is go down to the police station and inform the desk sergeant that she had information about the burglary. In a few moments she would have been introduced to the investigating detective. Who doesn't know that? And how did we get from CIA family unsubstantiated allegations of something that might hint that there could have been some kind of abuse maybe to...Whitey Bulger again? Eve is either the worst witness ever or just an average dissembler with an ulterior motive. I am not surprised or offended by the presumptions made in the comments. There are 2 aspects that are very difficult to untangle, the personal and the very public images. I am not surprised others look for some explanation that is easier to cope with than examing the facts. My personal relationships with the Webster family do nothing to change the facts in court records, police records, affidavits, witness information, and articles. Focus on what exists in those documents. This is examining what happened in an unresolved murder and the wrongful conviction of a man to provide someone to blame. The truth only gets buried when people focus on attacking the messenger. Being a family member who suffered the loss of a loved one and learning the explanation was fabricated is abuse that is difficult to fathom for those who have not experienced such injustice. Having a personal relationship to this and the family is difficult when gaining independent knowledge of events through actual documents contradicts what the family believes and influences. The Webster family should be on the same side of this issue, but they have not been privy to certain documents that exist. Focus on the case and the documents that exisist that support my concerns. Don't presume everyone fits the stereotypical behavior attributed without foundation. Now I would like to clarify points to help anyyone listening to an hour or so of audio that could not hope to cover the depth of this case. I have the documents with my daughters' allegations. Copies have been provided to numerous professionals and authorities. I can't even obtain copies of the report I filed with police. That takes some pretty considerable clout to be able to block. That is the personal aspect of this and there is no need to elaborate further. George and Eleanor Webster both worked for the CIA. That is documented as well as CIA activities at the time the Websters were there. The agency is sworn to secrecy, but FOIA documents do show serious misconduct within our agencies. Those are facts and well documented. It is not the typical type of family to relate to and can't be viewed in the same way you might expect in understanding familial relationships. Joan Webster disappeared and was murdered in 1981 when organized crime dominated Boston. Boston's history at that time was full of corrupt politicians, legal authorities, law enforcement, and agencies such as the FBI. Those are facts and well documented. Joan's remains were found buried in a remote area 8 1/2 years after she disappeared. The informant stated she was dumped overboard from a boat into the ocean. In examining MO's, Joan's remains were brutally beaten. The manner of her death and burial closely resemble victims from that era known to have been murdered by organized crime members of Bulger's operations. Law enforcement and prosecutors associated with Joan's case and another murder have verifiable connections to the organized crime activities going on at the time. The family maintains the informant is credible even though the statement is known to be false in many aspects. This was a 2 time murderer who was convicted the day before taking the alleged confessions from the suspect. Perhaps the basis for maintaining the credibility is based on the conviction the prosecutor gained in another murder case that was fused with Joan's case by the media. The documents support this was a wrongful conviction. I didn't create any of these circumstances, but have studied carefully to unravel a very complex case. To reach the truth, I am focused on the indivduals who block access to information in Joan's files while promoting a published theory that is filled with distortions and fabrications. This is an unresolved case and the truth is further obstructed. Consider that I have unravelled the very place never examined in this case and have the documents to support it. That certainly explains efforts to discredit what I have to say. Study Joan's case. I viewed your videos and comments on ytube, where you state "These are murder cases. Joan's remains unresolved, but a man was convicted by media. Part of the influence for that was the conviction for the Iannuzzi murder. The documents and evidence support this was a wrongful conviction. Was this man pursued to provide an excuse for the Joan Webster murder?" Why did Joan's murder need an excuse? Who was she a threat to, and how? I agree there is corruption in the judicial/political system - but you will need to be more specific to convince me Parediso was railroaded and that Joan's murder was, as you are hinting, a hit, covered up by powerful corrupt officials. Where's the why-for? Seems a bit shady that your concern and hot pursuit of truth began around the time of your divorce from Webster (2004?). Did the mob do the murder, did the CIA do it, or both? Lots of families work for the CIA - 98% of CIA personnel are paperpushers with little power to do anything anywhere. Even if Geo Webster had the power to run a coup in S. America you have no proof he did. The same methodology of "time lines" and whereabouts could be used to make my life look suspiciously company connected to Central America. Simply because your in-laws worked at Langley doesn't make your marriage to the CIA. How sad that your relationship with your daughters has come to the point where you consider them avaricious and influenced by the Webster money; that they would deny the hinted at sexual "abuse" in exchange for money. I cannot imagine feeling such about my own 2 daughters. Maybe you could scan and post "those documents that exist" so to better understand the "depth of this case." And one should never assume others " have not experienced such injustice" simply b/c they aren't buying your tale of innuendos. Shoot the messenger - a phrase more overused than an angry wife's accusations of "abuse" against the kids. Thank you Evelyn for taking the time to begin to look at Joan's case. I'll try to answer your questions as best I can. Some documents are already posted on a site that I have contributed to along with others that have different connections to these cases. There are other documents that remain confidential while FOIA efforts continue. They are very incriminating of certain individuals. Again it is hard to untangle the personal from the public issue of the case. Let me start when I began to look at Joan's case. An article was published in 2006 that the former ADA was going to publish a book. The case had failed to receive an indictment in a 1983 John Doe grand jury. I had no knowledge that a grand jury even took place until years later. On the personal side, I was still struggling trying to understand why I had been torn apart from my children. It didn't make sense and feedback I received was not consistent with who I know myself to be. Part of my reason was the behavior of the family privately conflicted so much with the public image surrounding Joan's case. Prior to this time I continued to focus on issues surrounding my chidren. The biggest question for me that had arisen out of Joan's case at that time was where she was found and the contradiction with the informant's story. That was the only discrepency I was aware of, but a glaring one. I trusted 2 things: my family and assuming they knew something I didn't, and that Paradiso had been convicted justly in the other murder case. The consensus everywhere was what could possibly be motivation for this to have been a premeditated murder. That is an area very difficult to peel open. Joan's files may or may not reveal that, but theories have been all over the map. My personal experience is one where I discovered things that certainly would be damaging for the family image. That explains what I have endured. If Joan had knowledge of family involvements whether personal or related to CIA activities, it may be difficult to determine the exact nature. I don't condemn the system as a whole, but am certainly aware our agencies were involved in some very bad conduct that is neatly excused and covered by the government. I agree with your analysis that anyone can be made to look bad. That is something I have encountered on a personal level. My position has remained with the documents I found of my girls that I found very troubling things and struggled with noticeable behavior issues and sought help in every avenue I could find. That is the right thing for a parent to do. Shame, fear, and money are very powerful tactics of control and all are visible in the circumstances with my children. To understand the effects of trauma based control on my girls, I studied 2 very good resources: Victimized Daughters by Janet Jacobs Liebman, and a behavioral study done by FBI special agent Kenneth Lanning. I am not cynical about my daughters' behavior as I have come to understand it. It has been just a little over a year since I really had the opportunity to examine the other cases involving Paradiso. Up to that point I still believed he was guilty of other crimes and that there must be something I was not privy to that connected him to Joan. In the course of examining all of this, I have been overwhelmed with all the things I didn't know even as a family member. The most troubling directly relates to your question why did someone need an excuse, someone to blame. The Websters were given Paradiso's name early on on the disappearance, January 1982. It was an anonymous call and the woman was later identified as Patty Bono. She gave pretrial testimony that was never verified. Despite having nothing verifiable to connect Paradiso to Joan, things moved very quickly to indict Paradiso in another crime where he was a suspect and implicate him in Joan's case behind the scenes. It didn't surface until almost a year later with the informant and that is when I first became aware of this individual. The question you pose rightfully should be asked of the Webster's. I have independent knowledge now of the informant, what came out in his statement, and how it was acquired. My question of the family is what is in this false statement that you believe points to Paradiso in Joan's murder? Or, why was it necessary to find someone to take the blame for the case? These are people with an intelligence background and trained in digging for information. In fairness, I look at the possibility the pressure applied to authorities to come up with an answer may have motivated gross misconduct, but it doesn't explain the apparent orchestration of her murder. I will begin to post documents on this site. Again remember, some information remains confidential as FOIA requests continue. For me, this is about Joan not George and Eleanor Webster. I have struggled personally with this a great deal. I have received counseling and have had to retain a lawyer. I am not very versed on how to load documents onto the forum that I have on my system. There are photos, pdf files and jpeg files. The first ones I want to load are the confirmations of the 2 anonymous calls placed to the Suagus PD and the Websters in January 1982. It establihes who knew what and when. Can anyone help me with the steps to get this loaded on the forum? Will arrange to upload these files. Standby. ...Anybody notice the similarities in this story with the recent Martin Scorsese flick The Departed? Edit: lol, just read the article below the audio. Greed is for amateurs. Anarchy, Chaos, now thats fun! The Departed is a remake of the Hong Kong 2002 hit Infernal Affairs, directed by Lau and Mak.